Various cradle assemblies for pipe size 2" (51mm) through 60" (1,524 mm) are available, along with replacement rollers. Darby PRC06-12 has 10 rollers to more evently distribute the load, some competitors use 8. The cradle design provides quick disassembly for transit and storage. Multiple urethane rollers spaced to support the pipe evenly and to prevent "egging". 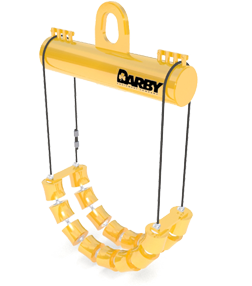 Darby uses springs between rollers which allows rollers to align themselves depending on the load, and reduces cable wear. Some competitors use pipe or cable clamps. 9" rollers have factory sealed ball bearings. All springs and axles are zinc plated to prevent corrosion. Lifting eye made from T1 steel and reinforced to reduce wear. The lifting lug on a Darby PRC extends through the head iron and is welded on the top and bottom of the head iron, making it stronger and more secure, and for maximum lifting capacity. All Darby cradles have had finite element analysis calculations performed on the weldments. Swaged sleeve to achieve maximum cable strength and meet OSHA requirements. The wire assembly meets the ANSI B-30-9 sling requirements, OSHA 1910.184, and OSHA 1926-251 material handling requirements. Pipe Size Range 36" - 48"